Anyone who loves genre fiction (which I'm assuming is everyone reading this and countless other gaming blogs out there) is aware that roleplaying games have had a huge impact on the authors of today. From George R. R. Martin to Jim Butcher the influence of tabletop games is strongly (and occasionally a little too easily) seen. In fact last year The New York Times actually admitted Dungeons and Dragons was influential when it came to the storytellers of today. Roleplaying games are good for creative types in general, and authors in particular. It isn't just the ease of character creation, or learning how to judge the ebb and flow of a tale with the whims of your dice, either (though that certainly helps). Often your next big project is going to start life while you're drinking Mountain Dew and pretending to be a wizard surrounded by some of your friends in a basement somewhere. There are a lot of authors out there, yours truly included, who start a character or adventure with a D20, but who just have to finish them off with a word processor. I'll even let you behind the scenes a bit and tell you which pieces began their lives as character sheets. Which Stories Started At The Table? Perhaps the most widely-read story directly influenced by my own gaming habits is my short story The Irregulars, written for Paizo's Pathfinder Tales. If you haven't read it, but you're a fan of Pathfinder, click the link and check it out. It's free to read, and it's a great introduction to my fiction if you're one of my readers who didn't know I wrote more than character builds and gaming guides. While most people who've read my work know me for that one story, there are actually a number of pieces I've had published that were born directly from tabletop games I've played. One of them is actually in my recently-released book New Avalon: Love and Loss in The City of Steam. 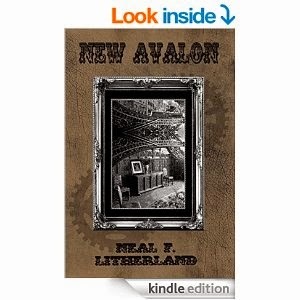 While this book is a collection of noir steampunk stories, buried right in the center of the book is a tasty tale titled The Legend of Black Jack Guillotine. It tells the story of a disgraced headsman who lost the woman he loved, and now haunts Headsman's Wharf exacting revenge on mortals as a way of doing penance for his own sins. His original incarnation was actually an urban legend in Waterdeep handed to the DM to keep the party from committing too many atrocities in the Dock Ward. Chase that innocent girl up a blind alley, and the next thing you know snicker-snack goes bloody black Jack. It worked surprisingly well, and the concept just wasn't satisfied with remaining a homebrew addition to a single, short-lived campaign. While this is the most recently-published story to draw on my gaming experience, there are a lot of others my fellow gamers might enjoy. One of my only self-published stories was Jungle Moon, which is a real Vietnam ghost story starring a character I guided through a horror game until he met a messy and untimely end (the full story on that campaign is right here). My story Terror on Saturn VI featured in the collection "Big Damn Heroines" was actually the continued adventures of a squad of female Imperial Regulars that were part of a home-brew Warhammer campaign run by a former DM. Even my story Paths of Iron and Blood featured in "Shadows of a Fading World" has a lead that began his life as a Kellid barbarian I wanted to play, but which I never got the chance to. As always, thanks for stopping by Improved Initiative! If you want to support me and my blog then check out my books, tell your friends, or if you want to be a little more direct just stop by The Literary Mercenary's Patreon page and become a patron today! And if you want to make sure you're getting all of my updates then be sure to follow me on Facebook and Tumblr as well.